Systematically practiced in the scientific world, communication is a central, complex exercise that responds to codes specific to the academic world, with specificities from one discipline to another. True “caudine forks” of research, symposia, conferences, congresses, national, European or international level require to transmit complex knowledge, sometimes the fruit of long years of research, in just a few minutes. Thus, to return his work in a time generally less than 20 minutes is often the first test facing a young researcher. However, these events lead to the grouping of experts from one or more fields, which for the most part possess a solid scientific background as well as a good knowledge of the research methodology. It’s when the audience is new to the subject that the problem is getting worse. As the philosopher Fontenelle said in his Conversations on the Plurality of Worlds , if it is a question of “entertaining” those who have “some knowledge by presenting to them in a somewhat more agreeable and cheerful manner what they know. already more firmly “, the challenge is twofold vis-à-vis” those for whom these subjects are new “: it is both instruct them while giving them want to go further in this exploration of the knowledge. 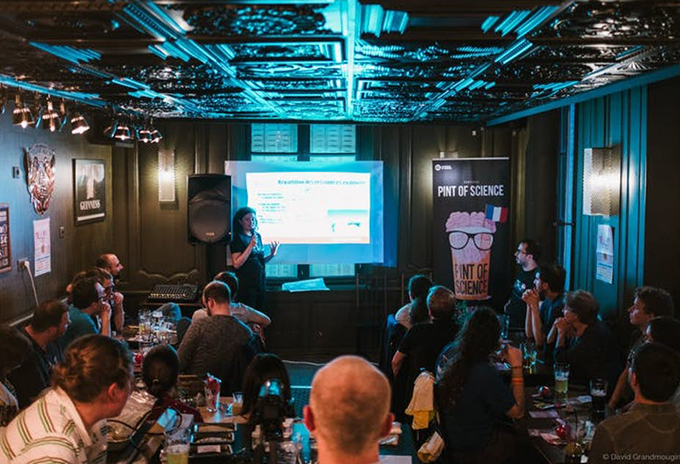 Born in 2012 in England, imported two years later in France by Elodie Chabrol, and today present in 21 countries including Switzerland, Ireland, the United States and Australia, Pint of Science (PoS) aims at this plurality of audiences. In France, the festival is organized every year in May, and resumes the time of the Science Festival in October. The principle ? Allow the general public to meet science players around a beer (to consume with moderation) or any other drink of your choice! Several meetings are held simultaneously in different bars each proposing various themes. For that (almost) everything is allowed: illustrations, videos, theater, quizzes, time’s up , brainstorming, riddles … From natural sciences to human sciences, the objective is to make the content dynamic and accessible, while promoting the exchanges in a casual and friendly. Ivory tower or tour at the bar? 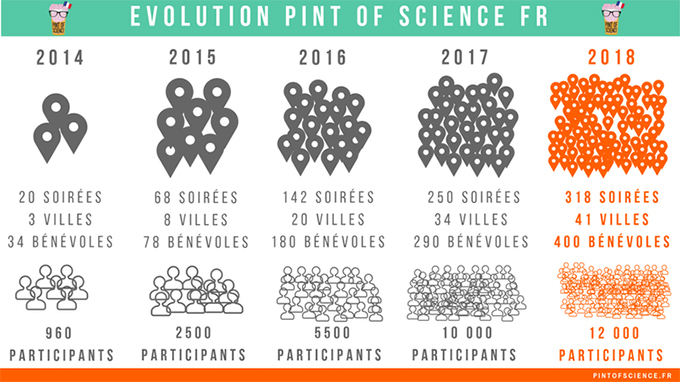 In 2017, the Pint of Science Festival brings together 34 cities and 10,000 participants. The PoS 2018 edition took place in some forty cities in France with more than 300 events offered throughout the country. The success of PoS testifies well to the rich relationship between research and its audiences, far from the myth of the researcher locked up in his ivory tower. By addressing topics as specific as “zombifying pests”, “stress measures in weightlessness” or “tangible interfaces for education” (part of the program Pos 2018, Metz and Nancy) and in events very often sold out, PoS shows that research is far from scary to the general public, quite the opposite! Among the participants who answered the surveys of the PoS parties on the cities of Metz and Nancy, 77, 8% did / do scientific studies. Not far from a quarter of the public has no notion of Science and yet is interested. In reality, it is the limited “expert” events that create this divide between society and research. Yet research comes from societal demands: they form one. The inventors of Pint of Science have understood this well. Dr. Michael Motskin and Dr. Praveen Paul, two London researchers, have discovered the curiosity and fascination that people bring to science by opening the doors of their lab. The PoS festival is a testament to the desire of researchers to meet and exchange with society, but also the interest and commitment of the general public to public research and those who exercise it. If the exercise allows the meeting between researchers and the general public, it also allows to link researchers from different disciplines. Evenings being on particular themes, the goal is also to bring together experts from different fields around a common subject. The result is one-night collaborations that enrich the debates, sometimes leading to longer-term collaborations.